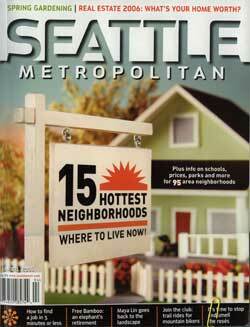 This article from the magazine "Seattle Metropolitian " was published in their April 2006 issue. Okay, I'll say it: life's good out here with the old folks. It's taken a couple of years to admit it, but there it is. 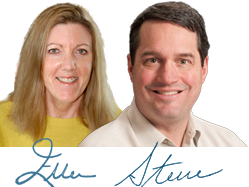 Last year my wife and I, both of sound mind and body and still a few years shy of 60, willfully sold our home in a very nice Seattle neighborhood and moved to a senior enclave a few miles outside Port Townsend. Cape George Colony, our new neighborhood, is not exclusive; a few forty and fifty somethings do live here, and some actually appear to have day jobs. There's no minimum age, no rule against kids or baggy pants or spiky haircuts. But there are no spiky haircuts here, and the closest things to baggy pants are Sears overalls with pockets full of screwdrivers. Port Townsend is gray and getting grayer; nearly a quarter of its population is over 65, twice Seattle's senior quotient. The figure for Cape George must be at least 75 percent. What possessed us to make a premature transition to senior citizenship? Economics, for starters. Thirty years of newspaper work were lots of fun but not very lucrative. We faced a choice: keep working to support that big old house, or sell the monster, downsize and reinvent ourselves on a budget. So we were out of there - but on to where? 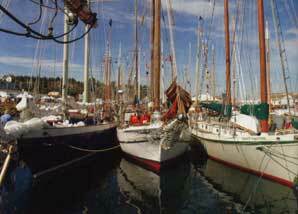 I'd been drawn to Port Townsend for some 35 years. Initially it had to do with those charming Victorians on Water Street. But the more I visited, the more I learned there was soul behind the brick facades ‑ a town of fewer than 10,000 that supports two good movie theaters, a dozen decent restaurants, blues and country music festivals, a damned good local newspaper, a lovely city park, two brewpubs and three excellent bookstores. Nothing happened until Mary and I visited an old friend, a college prof who had built her retirement cottage at Cape George. Our first impression was of a 1960s development: middle-class ranch houses on quarter-acre lots strewn along winding streets and cul-de-sacs. Definitely not our style. But then there were the "amenities": the full-size indoor pool and exercise room, the little marina where I keep my old Monk motor cruiser for a fraction of the cost of a Seattle slip. There are greenbelts and two miles of community-owned beach overlooking Discovery Bay and Protection Island. Mary could have ample room to garden in the middle of the Olympic rain shadow, with twice the sunshine and half the rainfall of Seattle. So we took the plunge, bought a lot and built a three-bedroom shingled cottage with a broad deck and a filtered view of the water-all for about one-quarter of what we got for our Madrona house. There are downsides. When we asked permission to exceed the building height limit by a few feet, I found myself facing a grim panel of elders who would have none of my nonsense. We witnessed a gurgling community fight over trees and views, and heard the usual elderly worries about security. Every neighborhood has its cranks and whiners, but seniors seem to have more to be cranky about and more time to whine about it. Still, we're a diverse group of people living diverse lives. Take our street: a retired airline pilot, a former history professor, a nurse-turned-part-time gardener, a software engineer, a retired physics professor who runs a small technology company in town, a couple of ex-schoolteachers, and Mary and me. One of my friends is a former Fulbright Scholar who's written a novel about revolutionary China. Another spent 30 years building Boeing airplanes. Some of us have PhDs, and others barely got out of high school; I forget which is which, because it really doesn't matter anymore. Some have plenty of money; others don't. Conventional wisdom has it that aging gracefully depends on income, but life at Cape George suggests otherwise. You need to pay the bills, but beyond that income seems irrelevant Quality of life hinges on more important matters; how people work and play, how they treat each other and how they cooperate. Cape George is a community of about 480 homes and good people run almost completely by volunteers from the board of directors to the marina committee and block watch captains. We have seen the future, and grayer. Get used to it. Keep building those 401K accounts. Find yourself a good financial planner. But most important, find a community of people you'd want as neighbors.